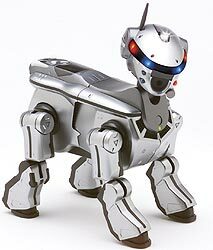 The Sony Aibo3 features a more aggressive look and improved technology over its former siblings. Ever since I saw the first "Sony dog" at a Sony event in New York, in 1999, I was impressed. At the time, I felt I was seeing the first new product of the 21st century and still feel that way. We are all getting a chance to see the future unfold in front of us and we get to participate in the birth of a new industry - real robots. Other journalists say "it's only a dog" and I heard one comment that "it won't wash my car". This is true, but technology needs to start somewhere. When the Wright Brothers first flew, there may have been pundits that said that he didn't have the distance or have in-flight movies (which hadn't been invented yet either). But progress occurred. In less than a century, we can "fly" into outer space and return with the Space Shuttle. The Sony Aibo3 is just like the first airplanes during the dawn of aviation, but you can now buy one. 6.0 is TechSmith's most recently released version of SnagIt. It provides time savings and added simplicity when capturing images from Windows screens, browser screens or interactive games. This latest version also includes image filters for better captures and supports layered window capture in Windows 2000 and XP. I have used SnagIt/32 for many years and have found it to be a stellar product -- a product that works every time, works well with other applications and doesn't crash your system. Many of the screenshots found on Reviews OnLine site were taken using this older SnagIt software. Capture every image on a Web page simultaneously, as well as capture all images on pages linked to the primary page. Support DirectX, the dominant imaging technology for games and CAD, by allowing real-time screen captures of dynamic images without degrading system performance. Capture text from applications or screen areas not supported by "cut and paste"
The new enhanced viewer included in SnagIt 6.0 includes a zoom capability to give you the ability to edit images at the pixel level. Also included is a zoom and pan capability to help you see the fine details in your screen captures. SnagIt is currently the world's most popular screen capture software and has more than 3.5 million users. Version 6.0 supports Windows 95, Windows 98, Windows NT, Windows 2000, Windows ME and Windows XP. It is available immediately and has a suggested retail price of $39.95.